Completely money service, Thanachart Bank Public Company Limited raises on business district of Chalermprakiet Ror 9 Road (By pass) before Lotus department store intersection. We offer a completely money service by bank, assets, life insurance and insurance. 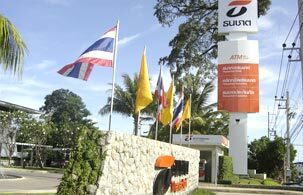 Covers totally 6 branches in Phuket, Phang Nga and Krabi. Thanachart Bank Public Company Limited covers totally 6 branches in Phuket, Phang Nga and Krabi; Phuket, at Central Festival Phuket, on Montree Road, Patong beach, Kok Kloy and Krabi. In the next future Thanachart Bank is going to rise a new branch to "begin" and "fulfill" the convenience with quick service for every customer.